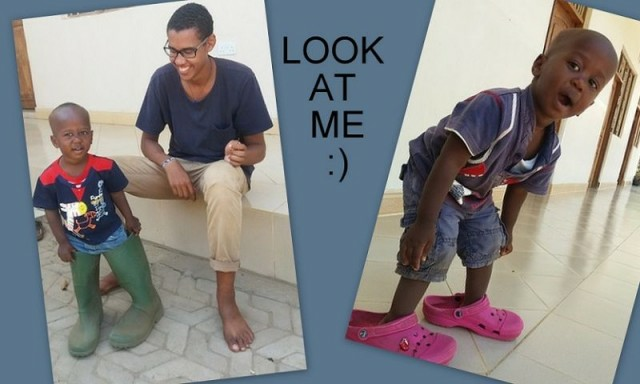 AS BIG AS THE SHOES WE WEAR! This year has started with a bang!! Probably for you too! Life has a strange way of running away with itself. Our plans can be turned on their heads by the most unexpected happenings. We don’t have a chapel “yet”, so most mornings, I leave Florian sleeping and I creep out of my room to my office to have my “special time” with the Lord before too much activity. This is the only time that seems to stand still. St Mark’s Gospel chpt. 4 stayed with me this week- Jesus said, “Let us go across the other side of the lake” – “Then a strong wind blew up”. After seeing the amazing ways God has provided for us here in the last 4 years, I thought I could never doubt Him again. Yet with every new circumstance there’s needs for a new step of Faith. The disciple’s trust was tested. Jesus was not disturbed by the storm, he wanted the disciples to be confident in him and to find the centre of stillness within themselves that only He can give. Along with that trust, and an authority, beyond their own, to command their situation to be at peace. Florian is going through a stage of wanting to wear everyone else’s shoes except his own I am sure that when he wears my shoes he thinks he is me and Julian’s boots that he thinks he is as tall as Julian. My prayer is that we can learn to step into Jesus’s shoes so that we have a deep knowledge of Who God is, and to Trust Him. We had an attempted break in again this week, and we need to reinforce our wall with electric wire and get 2 watch dogs. Our water bill has strangely doubled. We are not able to sell our pigs. 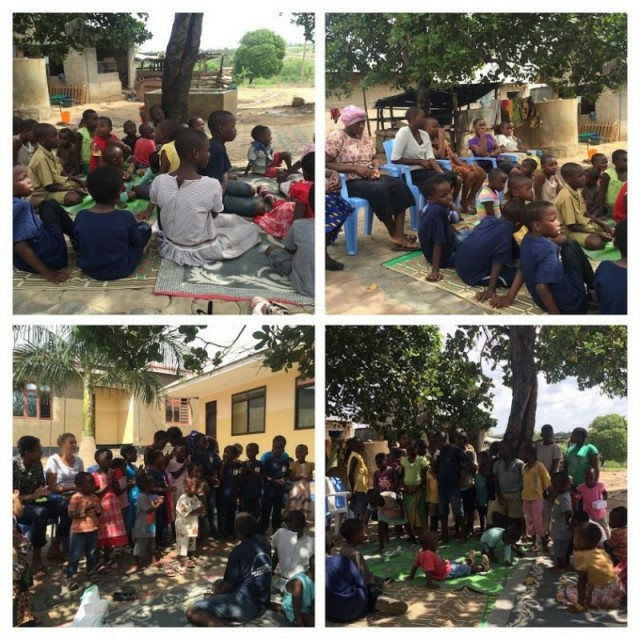 Some of the children are struggling with school and need special time. Bianca still doesn’t like to eat. All ordinary things of life stretching us “Mamas” to wear our Father’s Shoes! Please pray for us, as we continue to pray for all our friends. God bless you all and enjoy this month’s news! HARVESTER’s GERARD AND JERRY VISIT OVERNIGHT. We were so pleased to have Gerard return for his 4th time! He has seen this place grow from foundations to what we it is now. 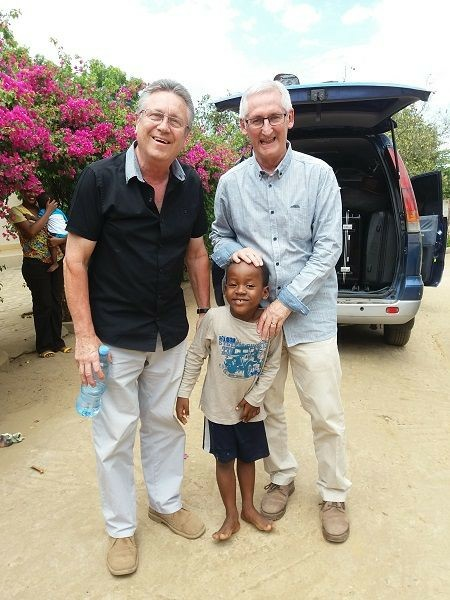 He has such a “Father Heart” not only for our children, but for the people – especially the men of Tanzania where he has ministered for many years. This year he travelled with Gerry and I don’t think it will be his only visit here. God bless you both for Hearts to bless and for leaving your families who missed you at home during this time. Also a very big thank you to Gerard’s Great Grand Son who sent us some of his toys. The children love their gifts! In our village we have a small out church called “Christ the King”, our main Parish in Tumbi is about 15 minutes away by car. 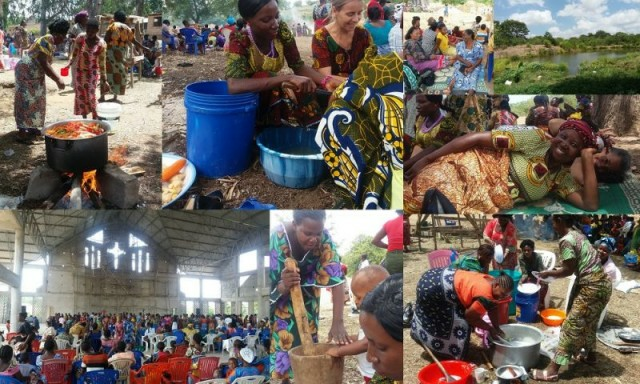 In the surrounding villages are another 8 out churches, and yesterday maybe 500 ladies from all the different villages picnicked together in the garden of the Main Parish where we are building a new church. Everyone happily cooking or preparing food and having fun together from 6am starting with Mass then breakfast and late lunch about 4pm! This was all at the invitation of the Parish Priest Fr. Benno who has a wonderful Charism of Joy and drawing people together. Ludmila and I were very happy to leave our responsibilities at home and have a different type of day. As you can see – Ludmila never rests! But I took an opportunity after peeling garlic to close my eyes! How is David so sure of His GOD? At this time of year, we could be desiring all sorts of things for Christmas. It’s not so customary here to go and do a big shopping spree for “Things” at Christmas. Instead, we fill our children’s stocking with some of the things that friends have brought for them throughout the year that we had hidden away. We are children of our Heavenly Father. He has stored up for us so many good things. He was unafraid of the giants in His life. He had learnt to see the one who could save him and not be overwhelmed by his troubles. He knew His God could never fail Him. This Christmas, gaze at the “Child Jesus”, who gave up everything to come as your Saviour. Saviour of all your concerns and fears. Be unafraid to ask him for ONE THING ONLY – to dwell in his presence all the days of your life. Then open up your heart to receive His gifts. Only in receiving fully can we be a gift to our closest, our neighbour and those suffering around us. Happy Christmas from us all at Karibu Nyumbani. Help Page updated - Take a look!! Yesterday, during the children's prayer time, Julian told the story of St Nicolas, how he was a very unhappy rich man. St Nicolas noticed other rich people who were becoming happy by giving away their riches. After the children's excitement that they were going to receive oranges and biscuits in their shoes, Ester reminded them that later in this season of Advent, they too were going to have an opportunity to visit poor people in the village. I felt humbled by seeing these children being asked to give away some of the little they have. 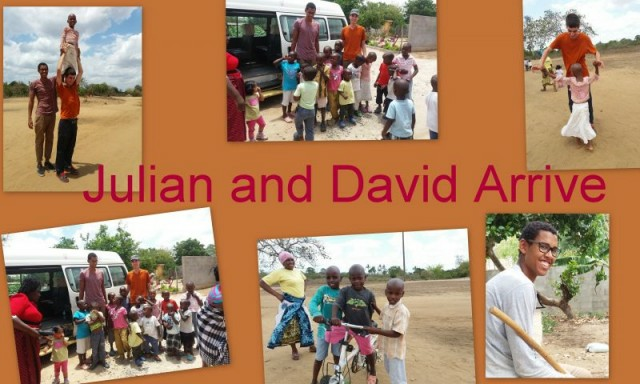 I have had some friends asking me how they can help the children here. Although the home and surroundings are beautiful, I am seeing that help is needed for daily expenses, which is why the shopping list idea might encourage even children to see that a little "regular" help can go a long way. Last Saturday was a full day. 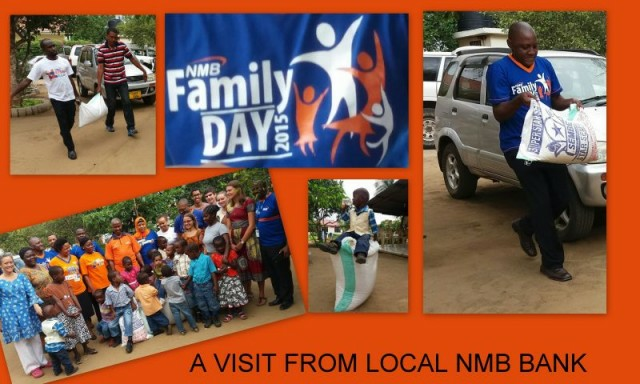 At 7am in the morning a large team of people from the NMB Bank arrived. Bringing maize, rice, beans and sugar. Thank you so much. You will never know how much we needed that! Invited to Jasmin’s Birthday by her Mother Devota. 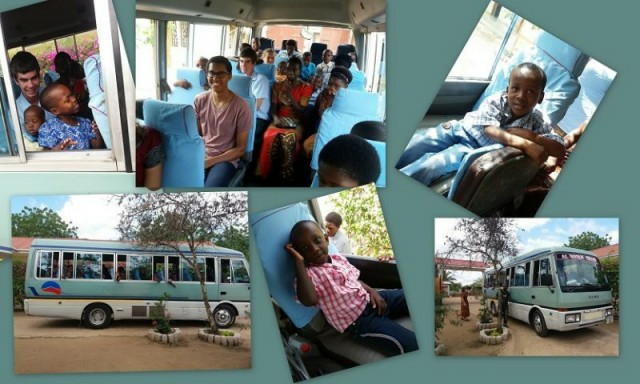 After goodbyes to NMB employees Saturday morning, along came a big bus to pick up our children, Aunties and volunteers to go to a birthday party. I wasn’t there so have no photo’s of the party but the children came back full of wonderful stories about good food and a bouncy castle!! Thank you so much Devota and Jasmine for the invitation to share this special day. Mother and daughter-Michelle and Ellie, have come to stay for three weeks, with a trip to South Africa squeezed in at the end to see Michelle’s sister. They were wanting to have a cross cultural experience before Ellie heads off for Uni. It is so good making new friends! - Thanks so much for coming!! 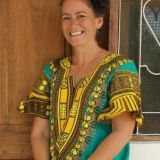 WHAT IS FIONA UP TO IN AFRICA? Fiona was in New Zealand for 6 months, 7 years ago. A mutual friend of ours offered her a flight for some timeout and prayer. 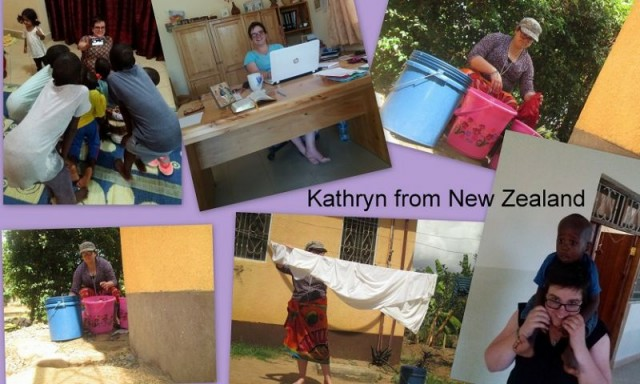 Fiona said to me recently "I was wondering when some of the friends I met in New Zealand would come and see what I was up to in Africa"....So here I am!! From the moment I heard Karibu Nyumbani was even a possibility I knew that this was my dreams, to come and visit Fiona in her new world. Since arriving two weeks ago, every dream has come true. I have so enjoyed seeing how this place has grown from nothing to what it is today. Seeing Gods provision and hearing so many stories of the right people being here at the right time during every step has touched my heart. 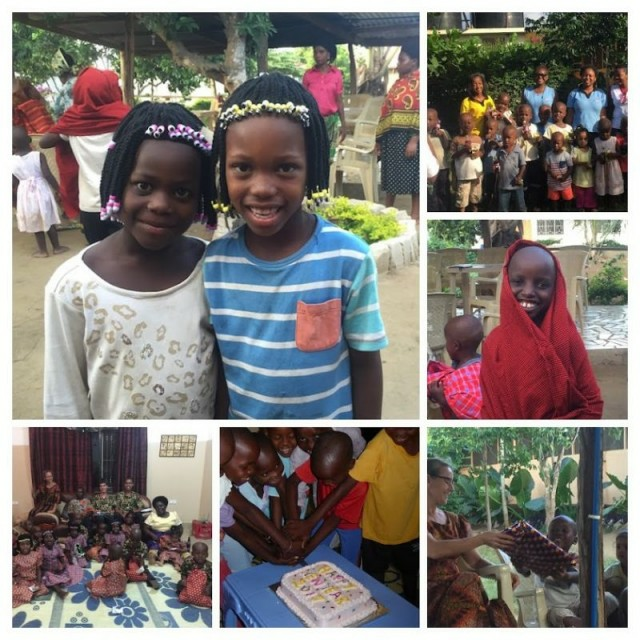 Through faith, prayer and hard work Karibu Nyumbai is going to change the lives of so many children, and it's exciting to see the plans God has in store for the future. I have another 6 weeks here, and judging by how amazing each day has been so far, I am going to have a life changing trip and I suspect this will not be my only one. 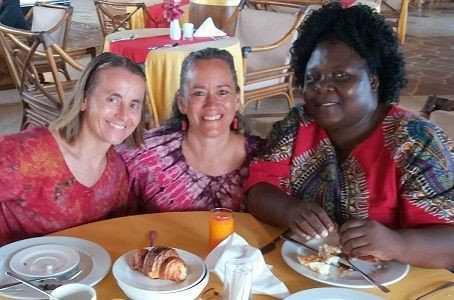 Ester, Ludmila and Fiona make the most amazing Mama's, the Aunties, Uncles and Volunteers have such a genuine heart for the vision of Karibu Nyumbani and a love for the Children that words cannot describe. I am learning not to be limited to my own expectations of what is possible in life. Being in Arica with Fiona, tells me anything is possible through God. So for now, I will finish with.. watch this space!! 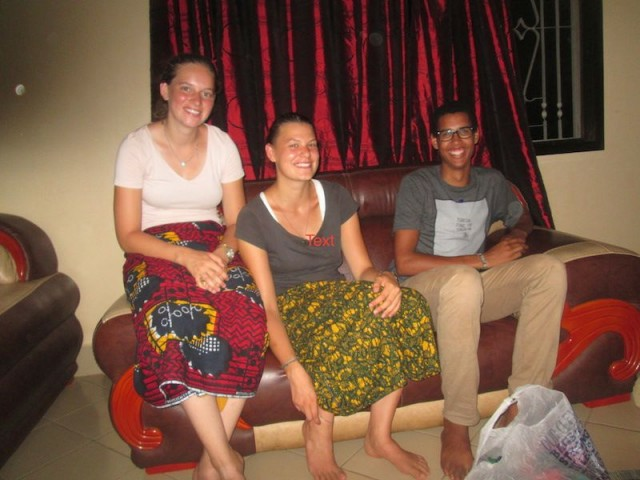 Lara and I have come from Germany and our new home for 10 months is in Kyela-South of Tanzania. Our kindergarten is closed at the moment so we are at Karibu Nyumbani for a month. 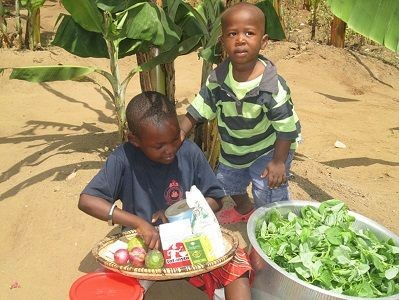 In Kyela we have enjoyed working in a kindergarten and also in the house, cooking, washing and cleaning. Water is in a problem there and we had to walk 800 meters taking usually 1 ½ hrs each day after our working day! In the beginning it was hard but we laugh every day and love the fact that the children are learning something from us. They are so funny, jokey and they are becoming like family. I have missed being so far away from my family but have loved getting to know the new culture and to really see how privileged we are in Germany. I has made me see that often what we think we need is not so necessary. The language was the hardest thing in the beginning for us both as it was a barrier not being able to understand or be understood, Language is so key to communication and creating a family. It's been so nice coming to Karibu Nyumbani, the kids have so much choice as to what they can do in their free time. 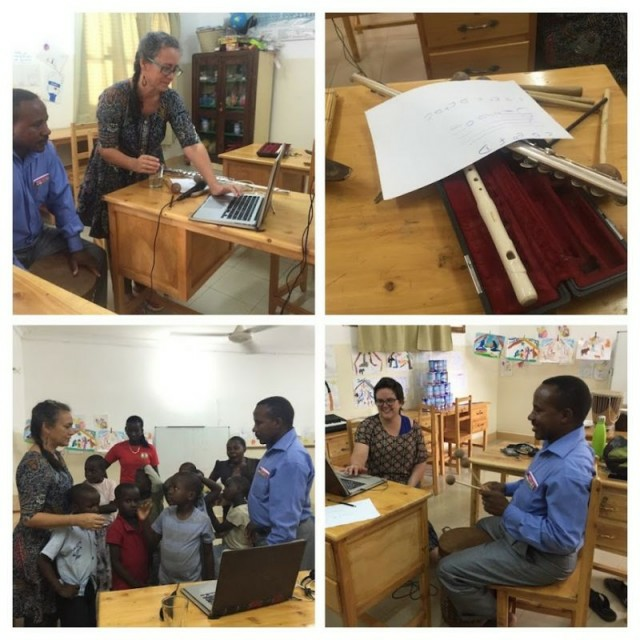 Having their own classroom is so good for extra learning and it's very nice that the children can speak two languages- English and Swahili. 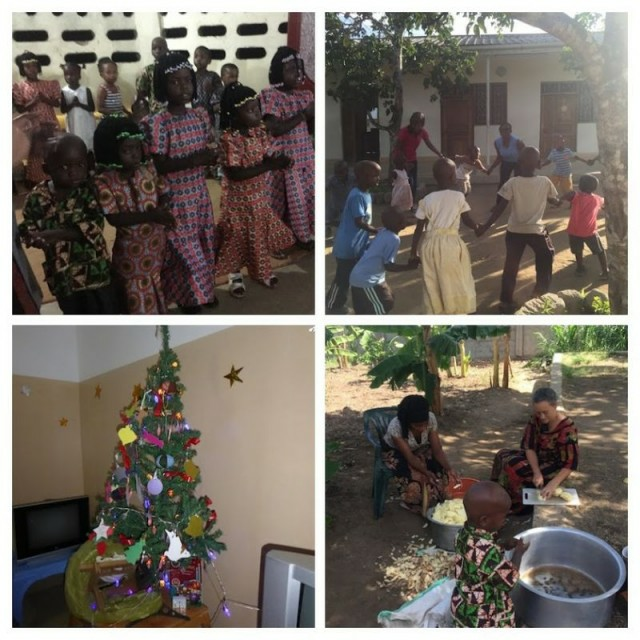 We have really enjoyed meeting up with two volunteers also from Germany and being able to eat the produce from karibu own garden has been wonderful. We love the way the children are really at home here. The facilities are stunning and luxurious in comparison to Kyela and we have felt like we are holiday. It's a wonderful place. Bibi (Grandma)Jane our Patron came with her sister and friend Caroline and Angela for a short visit a few weeks ago. 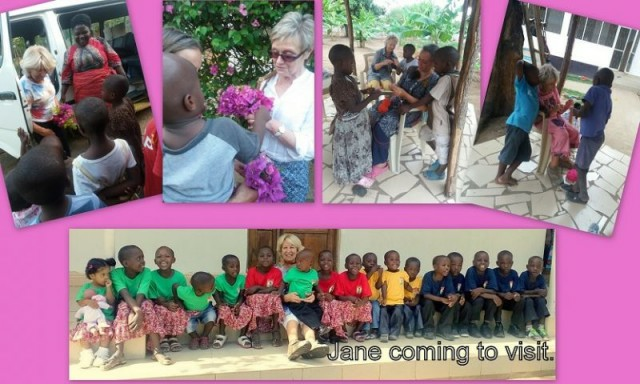 I am not sure that Jane likes to be called Bibi but the children certainly have a special place in their heart for her, as she obviously has for them. 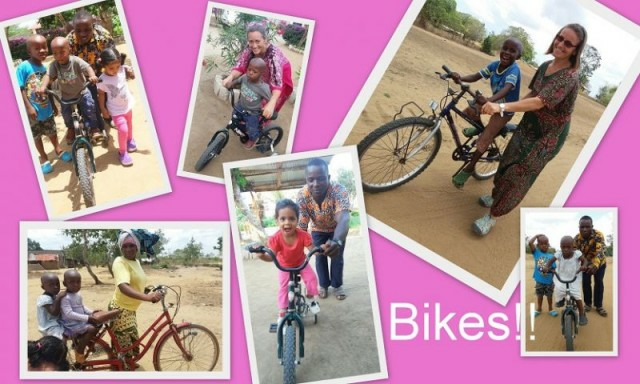 The three ‘Bibi’s came with all sorts of goodies for the children which members of their family helped them gather. Thank you all- it makes you feel part of our larger family! I am so happy to see the different profects in the shop doing so well. 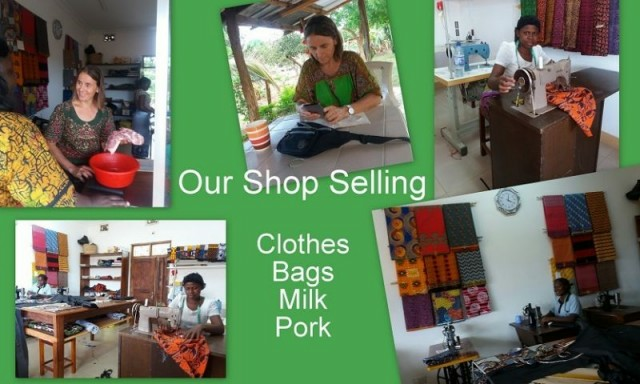 Last year I taught two girls from our village how to sew bags, purses, aprons and blouses and now they are able to sew without my assistance! Thanks to them we are selling bags in England, Czech and soon New Zealand. In the middle of November our chickens started to lay so it is great to sell eggs again. Also for the first time the other day we sold 30 kgs of our own pork! It is such a joy to get the Caritas students every year for 10 months. This year we have 2 boys! They have come at a time when we have needed a lot of small maintenance jobs so they are proving to be invaluable. 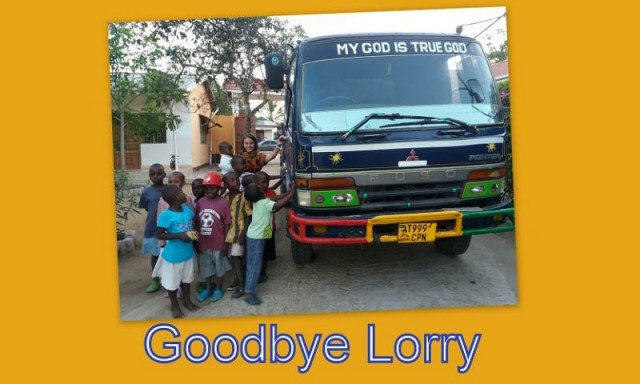 Back in October we had to make a big decision about our lorry- we were told that the price of the maintenance was higher than the it’s value and advised to sell it to buy a new one. A new one was beyond our means!. So we’ve taken a big step of faith to forgo the monthly income of our lorry and start another project! You will be hearing more about that very soon! It’s the second time our dear friend Brigitte has taken us on a three day holiday to stay in a hotel. This October we were very tired and it was a big blessing to have the break. I so enjoyed the eating and sleeping, while Fi and Ludmila did all the swimming for me. Really I thank Brigitte and her husband Martin for thinking of us, It was a life time treat for us.